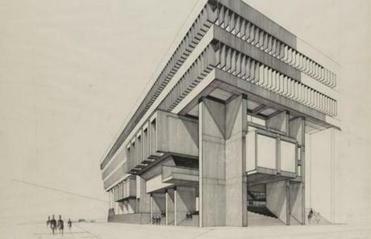 An architectural rendering of Boston City Hall, which was the subject of an unusual design competition in the early 1960s. Whatever else you might think about it, Boston City Hall is an improbable building. Call it a giant concrete harmonica or a bold architectural achievement, but to walk by this strange, asymmetrical structure in Government Center is to wonder how on earth it landed there. Boston City Hall has come in for significant criticism over the years. Mayor Thomas M. Menino has proposed selling it and investing in a more conventional headquarters. But the truly remarkable fact is that it was built in the first place. 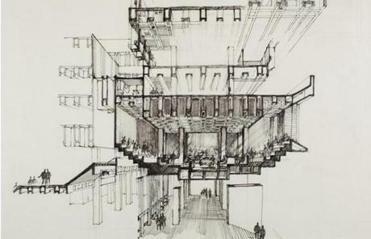 Experimental architecture, after all, is something we expect from museums and universities, not municipal governments. Take a look at other cities — Philadelphia, New York, Los Angeles — and you’ll find city halls adorned with columns and arches, domes and porticos. Some are made of marble. Some have giant clocks. Then there’s ours, which looks like a fossilized spaceship. Yet it wasn’t aliens who brought it here. Surprisingly, it was a group of Boston politicians and businessmen, along with two young architects named Gerhard Kallmann and Michael McKinnell, who conceived of the building as a dramatic gesture intended to help usher in a new era in Boston history. This year marks the 50th anniversary of a decisive moment in that campaign: namely, an unusual design competition mounted by Mayor John F. Collins, in which architects were invited to imagine a brand-new, forward-looking home for Boston’s city government. Boston was a very different place then. Until the 1950s, it had been a city “dying on the vine,” as US News & World Report put it, and the situation had improved only marginally when Collins took office in 1960. Economically stagnant, notoriously in thrall to political corruption, the city had seen little development for decades. As business owners decamped and residents fled to the suburbs, a fear took hold that Boston would soon be hollowed out for good. It was in this context that the city decided to demolish the neighborhood known as Scollay Square and build in its place what would come to be called Government Center. Forceful and bewildering, Kallmann and McKinnell’s Boston City Hall would be the centerpiece of this controversial plan to revitalize Boston’s economy and convince its citizens — and the world — that the city was changing. In the 50 years since, architects worldwide have declared Kallmann and McKinnell’s City Hall one of the greatest buildings of the 20th century. And yet its relationship with the people of Boston has remained uneasy, even hostile: Many regard the building as unwelcoming, cold, and ugly, while those who work inside complain about its poor lighting, ineffective heating system, and labyrinthine layout. Michael McKinnell (standing) and Gerhard Kallmann in Cambridge today. 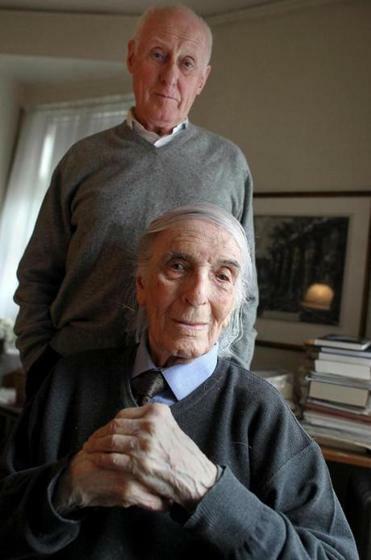 The architects who dreamed it up, meanwhile, are both still here in Boston. McKinnell is now 76; Kallmann is 96. 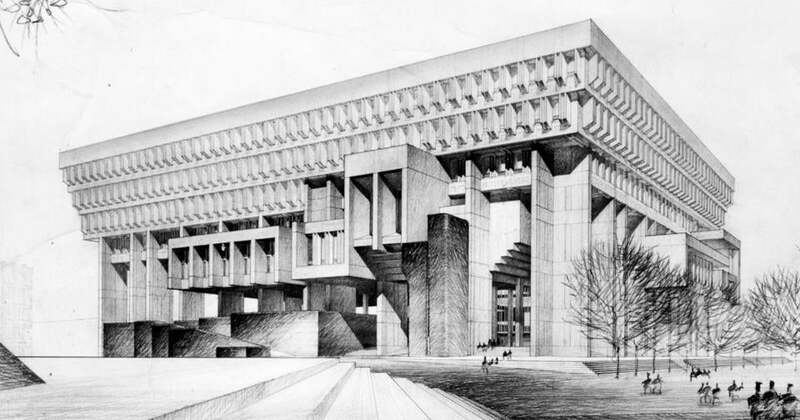 And as the 50th anniversary of their design for Boston City Hall approaches, they remain defiantly in love with it. Even Kallmann and McKinnell’s most passionate defense of their creation might not persuade critics to appreciate its bleak, windswept plaza or maze of concrete corridors. But the story of the competition that made them architectural stars goes far in explaining the presence of this polarizing building in our midst. Lifting the curtain on its history reveals not just the grand ideals that went into its design, but also that, however it may divide architects and regular Bostonians today, it played a pivotal role in bringing our once moribund city back to life. Kallmann was an architecture professor at Columbia University when he met McKinnell, then a 26-year-old graduate student recently arrived from Manchester, England. Despite the 20-year gap between them, the two became friends, united in their admiration of European architects like Le Corbusier, as well as their disdain for the “corporate modernism” then dominating New York City: sleek, dull skyscrapers held up by steel frames and wrapped in taut skins of glass. By contrast, the buildings that most excited McKinnell and Kallmann adhered to the principles of an architectural aesthetic called Brutalism, whose practitioners favored exposed concrete above all other materials, and prioritized authenticity over gleam and ornament. It was the spring of 1961 when the city of Boston announced a national design competition for its new City Hall, to be judged by a panel of local businessmen and architects. Such competitions were uncommon in the United States — the last time one had been held for a major public building was in 1912. But an influential Boston architect named James Lawrence convinced the mayor that instead of handing the contract over to a local firm, as Boston’s tradition of political patronage usually dictated, the design of the new building should be decided through an open, public process. MCKINNELL AND KALLMANN decided to enter the competition with two somewhat discordant goals in mind: to challenge people’s concept of how a monumental civic building should look, and to evoke a sense of optimism about democratic government. “You must remember this was 1962,” McKinnell said. “John Kennedy had just been elected president. And at least in young people, there was a tremendous sense of faith and investment and trust in the idea of government.” To capture that feeling, the architects sought to make their City Hall accessible and transparent. The design featured an open space in the center of the building that people could enter directly from the plaza, and external features — those large protruding bumps — showing the locations of the City Council Chamber and the Mayor’s Office. Neither McKinnell nor Kallmann possessed an architect’s license, a prerequisite for entering the competition. To that end, Kallmann invited his friend Edward Knowles, an established architect with a firm in Manhattan, to join their team, providing them with credentials as well as a place to work. The architects spent the winter poring over sketches in Knowles’s basement office, working at night and trying to clear out before the firm’s staff arrived in the morning. Though the two men labored as equals, often sitting at one desk and drawing simultaneously on the same piece of paper, McKinnell addressed his partner as Professor Kallmann — a habit he would not break for many years. In January 1962, the pair learned they were among the eight finalists chosen by the jury, from among more than 250 submissions. They had three months to provide a set of detailed new drawings as well as a model. They worked until the last possible minute; in the end, they put the model on a plane to Boston with one of their assistants, who finished it during the flight. The jury deliberated for several days, holing up at the MFA while a police officer stood guard outside the door. Finally, rumor had it, the choice came down to two designs: one by the firm Mitchell/Giurgola, and the other by Kallmann, McKinnell, and Knowles. On May 3, 1962, a crowd of 300 people, including city officials, journalists, and many of the competition finalists, gathered at the MFA to hear the results. Renderings of the eight designs hung on the walls, but all eyes were on the table in the middle of the room, where the winning model had been placed underneath a white sheet. No one but the jurors — not even Mayor Collins — knew which it was, and McKinnell and Kallmann peered at it, trying to ascertain whether it could be theirs. When the sheet was lifted to reveal their model, there were gasps in the room. One person reportedly exclaimed, “What the hell is that?” Dazed and elated, the winning architects went to shake hands with a no less befuddled Collins. McKinnell said, cautioning that the story may be partly apocryphal. After City Hall’s completion, Bostonians commonly complained that the place was an inscrutable, inhospitable eyesore. And yet the broader effort that had led to its construction was undeniably succeeding. Thanks in part to the development of Government Center, Boston was becoming a thriving city. Businesses were opening up downtown; developers broke new ground on buildings. “Whereas we can count on one hand the number of large-scale development projects in the city prior to the Boston City Hall competition, development in the decade following the competition flourished,” said Brian Sirman, who teaches a course called Reviled Architecture at Boston University and is writing his doctoral thesis on the history of Boston City Hall.. Eventually, Boston’s ramshackle past faded into memory. And while there’s no doubt that City Hall was just one piece of a puzzle that also included the development of the Prudential Center, the Central Artery, and Faneuil Hall Marketplace, it went a long way toward changing the perception that Boston was a city with a past but no future. “It jump-started the city’s sense of itself, and what it could be, and did it in a very dramatic, non-Boston way,” said Morgan. AFTER WINNING THE COMPETITION, Kallmann and McKinnell moved to Boston to oversee construction. They ended up staying for good, opening a firm, and going on to design many more local buildings. Today, while Kallmann has retired, McKinnell and his team are still going strong. They are currently at work on a new building in Jerusalem. Back at Kallmann’s apartment, I asked the architect what he and his partner had imagined Boston City Hall would be like when it was built — what they were picturing as they worked on their sketches in that basement in New York. But how did they want people to feel when they looked at it? I asked. What were they hoping it would evoke?